I have had this plant for 20 plus years and it has always done well in my office setting. About 8 months ago my job ended and I had to bring my plant home. I placed it in the warmest room of my house and it did great. This was winter time. Now my leaves are falling off and/or turning black. I tried to re-pot the plant into a bigger pot. I moved it out of the warm room because there is not air in there thinking that was the issue. I’m thinking either too much water and not enough sun. Maybe a fungus. I just don’t know what to do. I’m not sure I have the name of this plant correct. Can you let me know what is wrong. You do have the correct botanical name. It is more commonly called Madagascar Palm. The darkening and dying of leaves is a generic symptom with multiple possible causes. In fact, it commonly sheds some leaves in the winter months or any time when it does no get enough light, temps are too coo or water is inadequate. 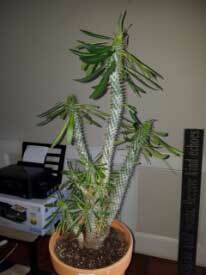 Your plant did well for 20 years in your office environment and it was adapted to that environment. It is now reacting to the change. You should try to duplicate that environment as best you can. In general, this plant enjoys maximum sunlight and soil that is allowed to get dry about halfway deep into the pot, much like a Cactus. Temps must be above 60 degrees F. at all times and the warmer the better. 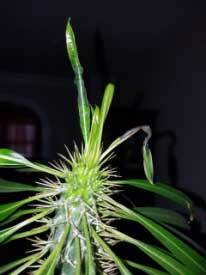 Air circulation is not really a problem and this plant rarely has pest or disease problems. Unfortunately, repotting it was not a good idea. A larger pot with excess soil tends to stay moist for too long and can cause root rot especially if you don’t compensate with a reduced watering routine. In addition, most folks do not know how to repot properly and inadvertently damage the fragile roots during the repotting process. You may want to consider moving it back into its original pot wit its original soil. Otherwise, provide maximum sunlight, warm temps and allow the soil to dry out between waterings. Do NOT use fertilizer or any other supplements. Be patient and don’t worry about leaf loss. If you are providing proper light, temps and water, new leaves will eventually grow back in. Finally, put it into its best environment and then leave it unchanged. Plants do not like change.